From Reuters via Kyle's Phyles: "At least 14 people were killed on Tuesday when a gunman in a police uniform opened fire on worshippers gathered at a shrine in the Afghan capital of Kabul for a Shi'ite holy day, officials said." 1. Pallas ruled by Saturn which is parallel Pluto. 2. Venus trine South Node and ruled by Mars which is sextile Neptune. 3. Venus ruled by Pluto. 4. Moon ruled by Saturn which is parallel Pluto. 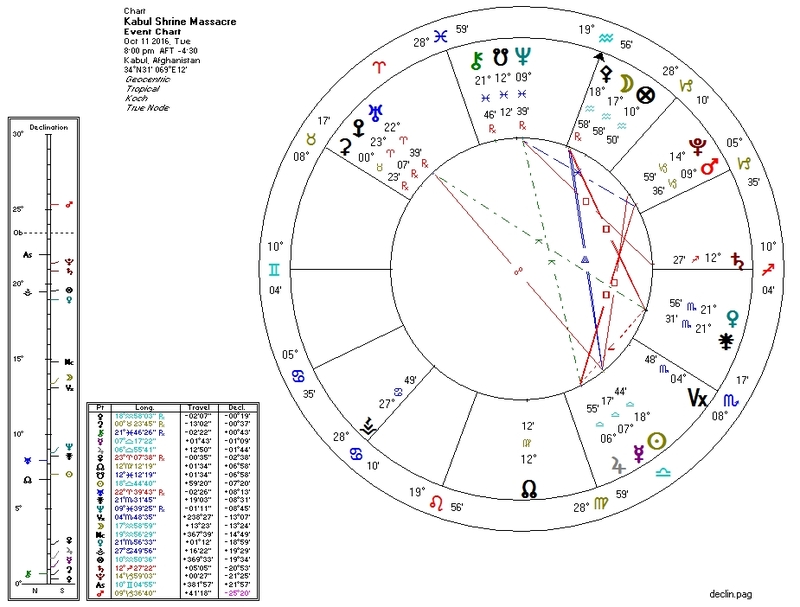 A weaker astrological configuration and lower body count from the bombing in Yemen this past weekend.